Jen Buffington, Stitched, Williston, VT created this sweet Pocket Advent Calendar Banner for BERNINA’s holiday catalog. Visit her at http://www.stitchedvt.com/. I loved Sweetwater’s House Pocket pattern, but I wasn’t sure how to use the little houses. I purchased the pattern during the holidays and I was in the middle of decorating for Christmas (which I do before Thanksgiving!). My kids love running downstairs every morning during December to check our store-bought advent calendar, and I realized that the pocket houses would be just perfect to make my own calendar! The pockets are just big enough to hold two little treats. The houses were a huge hit with the kiddos and they look forward to it every year! They play with it for months afterward―hiding things in the pockets. Since then, I have made one for Halloween as well (not that they need any additional treats during the month of October!). My Halloween version has only 13 houses. I hope you and your family enjoy it as much as we do! I used the very cute “House Pocket Pattern” from Sweetwater that I found on Etsy. First I cut out 24 houses. I made a “window” for each front door: Use your BERNINA embroidery machine to embroider the numbers 1-24. Use the Enlarge/Reduce tool in the onscreen editing screen to adjust the size of the numbers to 1″ square. Adhere a double-sided fusible web (such as Heat ‘n Bond Lite) to your fabric prior to embroidering. After stitching, cut out the numbers with a slight border so that they measure approximately 1.25″ square and fuse them to the door prior to sewing together your pieces. You can topstitch the numbers down if desired. To assemble the banner I measured the area where I wanted to hang the advent calendar and made a strip of double-folded bias tape to the desired length. 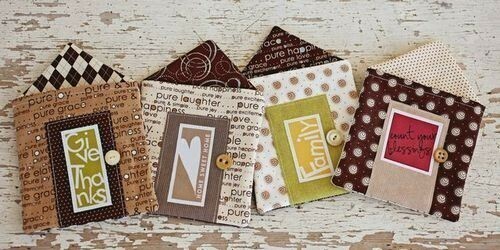 You could also use a piece of twill tape or sturdy ribbon. I sewed a piece of rick-rack to the bias tape for decorative purposes. Then I embellished the top of each house with buttons and felt flowers and stitched them to the tape in order and spaced evenly. Voilà! 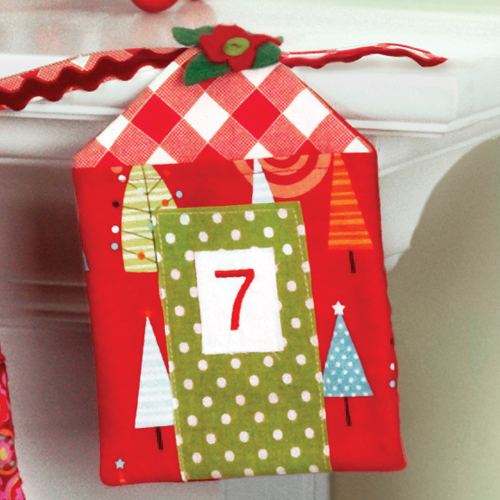 An adorable pocket advent calendar to fill with holiday goodies!